Home/Information/Looking For A Wedding Ring? Are You Trying To Select A Wedding Band? When we talked to the majority of husbands to be, the biggest concern that we kept hearing was that you did not like the feeling of wearing a ring. As we watched men try on rings for the first time we could see you fidget and wiggle the ring trying to get it comfortable. Brides to be would love you to try on almost every ring in store, while you wanted to take the first one that fit. We must remind you that a wedding band has to be worn (your fiancee will make sure of it!) every moment of every day unless a health and safety issue for your job. 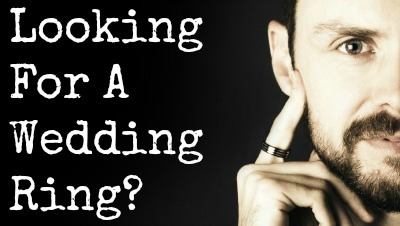 The biggest thing we can recommend to help is looking at wearing a titanium wedding band. Titanium is more commonly known as an extremely strong metal, however, one of the biggest benefits to the wearer is that it is also the lightest metal. Most men notice a difference instantly when they try a normal band versus a titanium band. Mens Wedding Rings HQ titanium wedding bands are thin in width as well, preventing the awkwardness of having thick edges rubbing up against your other fingers. Lastly, our wedding bands feature our comfit fit finish. This is where we have designed the inner band to be curved to tapper to the shape of your finger. Titanium is also hypoallergenic and will not tarnish or rust when exposed to water, chlorine, salt and anything else your wedding band will become exposed to during day to day wear. We cover your ring with a lifetime structural warranty on normal wear and tear plus we have a Fit for Life program.